To change the date range, click on the time period drop-down and select the range you are interested to analyze. To filter by account, pitching initiative or employee, click on the "View" drop-down. 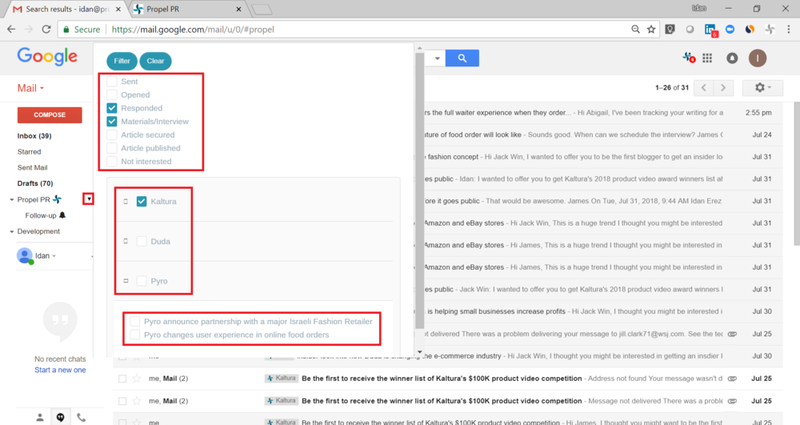 The Propel Gmail Plug-In* allows you to pitch reporters and influencers directly from your Gmail inbox. All you need to do is download our Chrome extension. 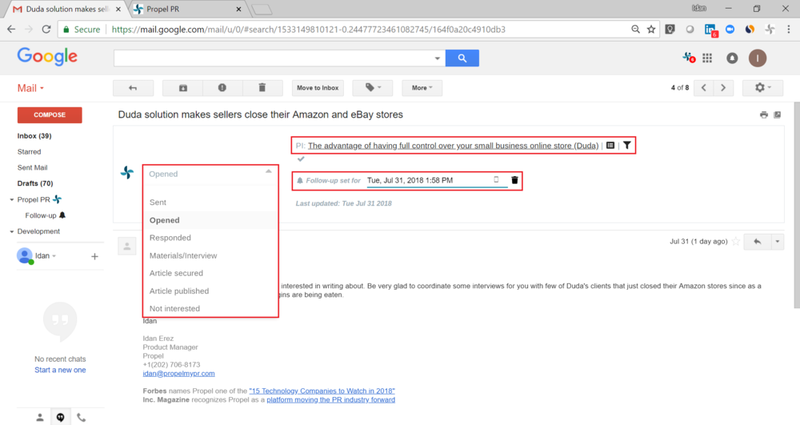 * Propel Gmail Plug-In works best using the new Gmail User Interface. 1) Click on the Propel logo on the top-right cornet, enter your user credentials and click login. 2) If the login was successful the Propel icon will change it’s color and your name and notifications will appear. 1) After installing the plug-in, you can start pitching by simply clicking on the Propel logo (next to the send button) in a compose new message window. 2) Then you will be asked to select a pitching initiative. You can either pick from the most frequently used or search for a pitching initiative by entering the pitching initiative or account name. If the pitching initiative doesn't exist in Propel yet - click "Create new" to add it. 3) To add recipients, you can either enter their contact details manually in the “To” field or click on access your Propel Media List directly from Gmail by clicking on the “Media "List” button. 4) Using the media list you can select which contacts you'd like to pitch now by clicking the checkbox next to their name. You can search reporters by media outlet and filter by their status in the specific media list. 5) If you select more than one recipient, each of the recipients will receive a separate email, which you can personalize by using Propel's mail merge feature. Do this by clicking on "Mail Merge" and selecting the variable field you desire – options include first name, last name and publication name, etc. *NOTE: Mail merge does have two limitations - First, you must send the first email using the Propel extension and not from your mobile device or a different browser. Second, no attachments are allowed in the first email when pitching multiple contacts at the same time. If you want to attach a press release or media kit we recommend including a google drive or dropbox link instead. 6) Propel also allows you to save and share templates for later use to save time and improve the quality of your pitches and follow-ups. To save a template, write a personalized message using the mail merge function, implement inline images and click “Templates\Save Template” when you are done. To load a template, click “Templates” and select the one you want to use. 7) You can set a reminder to follow-up with the contact(s) you are pitching to if you don't hear back from them in a specific time period or by a specific date. 8) The last step of pitching will be sending the email. You have two options: click “Send” in order to send the email(s) now or “Send Later” in order to schedule the email to be sent at a later time. Selecting one of the morning options will send the email between 9 to 10 am on local sender timezone. After clicking on the “Send Later” button the email will automatically saved as draft and will be sent at the selected time. To cancel or change timing go to the draft folder and open the relevant thread. Now that you have pitched, the plug-in helps you track responses and organize all of your reporter interest in a clear way that helps you prevent opportunities falling through the cracks. 1) Click on the Propel logo to check if you have follow-up reminders due, which are represented by the number in the red circle. Then, click on the notification to go directly to your Propel's follow-up folder. 2) Click on the Propel folder in your Gmail inbox to see all of your ongoing communications with reporters. Here, you can filter by account, pitching initiative or status (sent, opened, responded, etc.). For example, you can easily see all of your pitches that were opened and not yet responded, in order to follow-up, or the ones that are awaiting materials or an interview in order to remind you to touch base. 3) Finally, every time you hear back from a reporter, you can update the story funnel status or set yourself a new follow-up reminder from the open mail thread itself. You can also track and organize all of your reporter opportunities through the Propel Story Funnel in the web app. © Propel 2018. All Rights Reserved.